environment with relatively high temperatures. This causes a build-up of electrostatic fields which can distort the phase of the signal from the CD to the speakers. Such phase anomalies result in a degradation of the sound quality. STATMAT addresses this problem by evening out the low-voltage 'hot spots', ensuring that the reproduction is as true as possible to the original recording. " 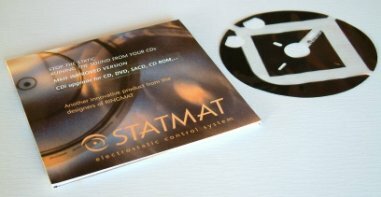 STATMAT is coated with a unique pattern of specially formulated conductive inks which level out the electrostatic fields around the CD, ensuring that the signal recreated by the digital circuitry is phase-correct before it is sent to the speakers. Therefore, as the signal suffers no phase distortion, the resultant sound is more vibrant, with an improved sense of timing and rhythm, clearer intonation and enhanced imaging.